WWF says governments who participated in the third Bonn climate change talks this week now must ramp up their negotiations, or they will waste a crucial opportunity to move forward in Cancun later this year. Bonn, Germany – WWF says governments who participated in the third Bonn climate change talks this week now must ramp up their negotiations, or they will waste a crucial opportunity to move forward in Cancun later this year. "Governments can and must make progress on areas such as adaptation, finance and ending deforestation at COP 16 in Cancun," said Gordon Shepherd, Leader of WWF's Global Climate Initiative. "But they will have to increase their efforts now and start seeking areas of convergence in a much more serious way." Reducing emissions from deforestation and degradation (REDD) is an example where agreements already achieved in Copenhagen have been opened up again on such basic issues as the definition of what it covers. The United Nations Framework Convention on Climate Change (UNFCCC) inter-sessional in Tianjin, China later this year is the last opportunity for these governments to resolve any outstanding issues in time to agree to a good package to address climate change in Cancun at COP16. Such a package would be a major stepping stone to a legal-framework to be adopted at COP17 next year. "Parties also need to make progress in other areas such as the sources for climate finance and not just wait for the UN Advisory Group on Finance (AGF)," said Shepherd. 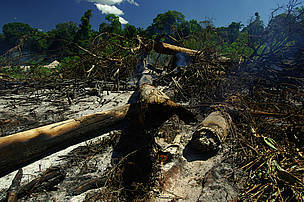 It is important for governments to move away from the "all-or-nothing"-approach at the UNFCCC, and seek breakthroughs for a balanced Cancun package in areas such as forest protection, adaptation to inevitable threats from climate change, and the beginning of real flows of finance for climate action, WWF says.